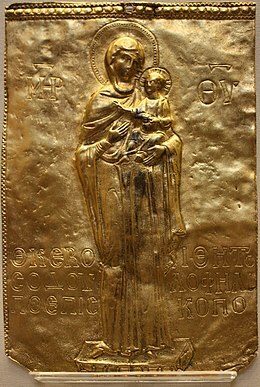 A Hodegetria (Greek: Ὁδηγήτρια, literally: "She who shows the Way"; Russian: Одигитрия), or Virgin Hodegetria, is an iconographic depiction of the Theotokos (Virgin Mary) holding the Child Jesus at her side while pointing to Him as the source of salvation for humankind. The Virgin's head usually inclines towards the Child, who raises his hand in a blessing gesture. In the Western Church this type of icon is sometimes called Our Lady of the Way. 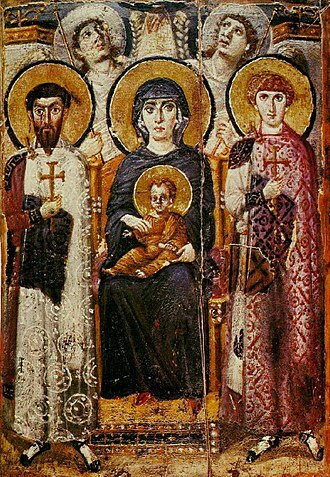 The most venerated icon of the Hodegetria type, regarded as the original, was displayed in the Monastery of the Panaghia Hodegetria in Constantinople, which was built specially to contain it. 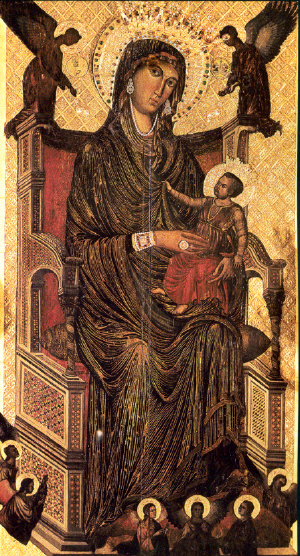 Unlike most later copies it showed the Theotokos standing full-length. It was said to have been brought back from the Holy Land by Eudocia, the wife of emperor Theodosius II (408–450), and have been painted by Saint Luke the apostle himself. The icon was double-sided, with a crucifixion on the other side, and was "perhaps the most prominent cult object in Byzantium". 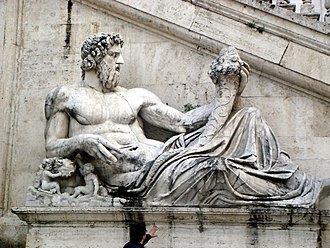 The original icon has probably now been lost, although various traditions claim that it was carried to Russia or Italy. There are a great number of copies of the image, including many of the most venerated of Russian icons, which have themselves acquired their own status and tradition of copying. 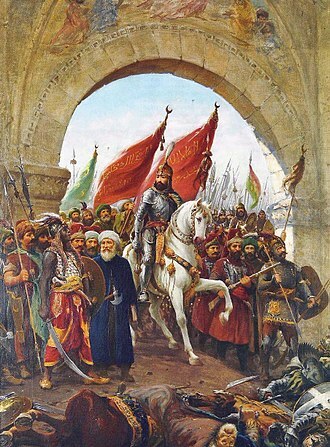 There are a number of images showing the icon in its shrine and in the course of being displayed publicly, which happened every Tuesday, and was one of the great sights of Constantinople for visitors. 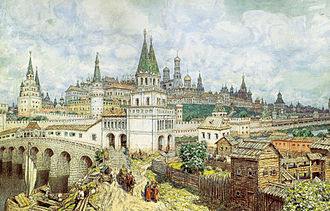 After the Fourth Crusade, from 1204 to 1261, it was moved to the Monastery of the Pantocrator, which had become the cathedral of the Venetian see during the period of Frankish rule, and since none of the illustrations of the shrine at the Hodegetria Monastery predate this interlude, the shrine may have been created after its return. Every Tuesday twenty men come to the church of Maria Hodegetria; they wear long red linen garments, covering up their heads like stalking clothes […] there is a great procession and the men clad in red go one by one up to the icon; the one with whom the icon is pleased is able to take it up as if it weighed almost nothing. He places it on his shoulder and they go chanting out of the church to a great square, where the bearer of the icon walks with it from one side to the other, going fifty times around the square. When he sets it down then others take it up in turn. Another account says the bearers staggered around the crowd, the icon seeming to lurch towards onlookers, who were then considered blessed by the Virgin. Clergy touched pieces of cotton-wool to the icon and handed them out to the crowd. A wall-painting in a church near Arta in Greece shows a great crowd watching such a display, whilst a street-market for unconcerned locals continues in the foreground. The Hamilton Psalter picture of the shrine in the monastery appears to show the icon behind a golden screen of large mesh, mounted on brackets rising from a four-sided pyramidal base, like many large medieval lecterns. The heads of the red-robed attendants are level with the bottom frame of the icon. 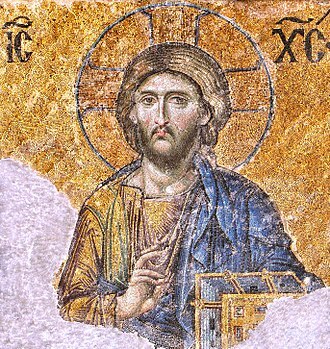 The icon disappeared during the Fall of Constantinople in 1453 when it was deposited at the Saint Saviour in Chora. It may have been cut into four pieces. In the 10th century, after the period of iconoclasm in Byzantine art, this image became more widely used, possibly developing from an earlier type where the Virgin's right hand was on Christ's knee. An example of this earlier type is the Salus Populi Romani icon in Rome. Many versions carry the inscription "Hodegetria" in the background and in the Byzantine context "only these named versions were understood by their medieval audience as conscious copies of the original Hodegetria in the Hodegon monastery", according to Maria Vasilakē. Full-length versions, both probably made by Greek artists, appear in mosaic in Torcello Cathedral (12th century) and the Cappella Palatina, Palermo (c. 1150), this last with the "Hodegetria" inscription. From the Hodegetria developed the Panagia Eleousa (Virgin of Tender Mercy), where Mary still indicates Christ, but he is nuzzling her cheek, which she slightly inclines towards him; famous versions include the Theotokos of Vladimir and the Theotokos of St. Theodore. Usually Christ is on the left in these images. 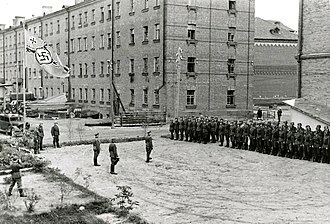 The shrine of the Hodegetria in Smolensk, as photographed by Prokudin-Gorsky in 1912. Some Russians, however, believe that after the fall of Constantinople, St. Luke's icon surfaced in Russia, where it was placed in the Assumption Cathedral in Smolensk. 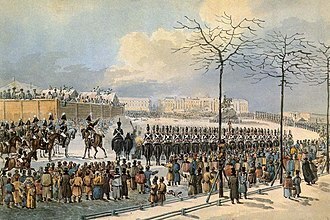 On several occasions, it was brought with great ceremony to Moscow, where the Novodevichy Convent was built in her honour. Her feast day is August 10. This icon, dated by art historians to the 11th century, is believed to have been destroyed by fire during the German occupation of Smolensk in 1941. A number of churches all over Russia are dedicated to the Smolensk Hodegetria, e.g., the Smolensky Cemetery Church in St. Petersburg and the Odigitrievsky Cathedral in Ulan-Ude. 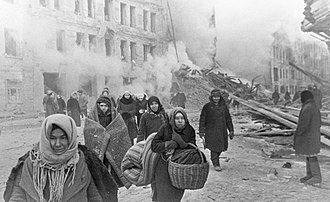 They may refer to the Theotokos as "Our Lady of Smolensk." 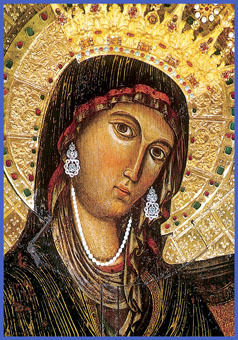 An Italian tradition relates that the original icon of Mary attributed to Luke, sent by Eudocia to Pulcheria from Palestine, was a large circular icon only of her head. When the icon arrived in Constantinople, it was fitted in as the head in a very large rectangular icon of Mary holding the Christ child; it is this composite icon that became the one historically known as the Hodegetria. 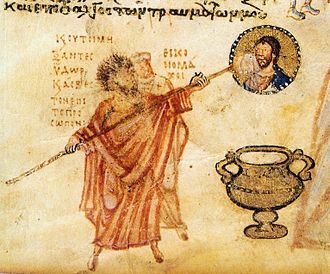 Another tradition states that when the last Latin Emperor of Constantinople, Baldwin II, fled Constantinople in 1261, he took this original circular portion of the icon with him. It remained in the possession of the Angevin dynasty, who likewise had it inserted into a larger image of Mary and the Christ child, which is presently enshrined above the high altar of the Benedictine Abbey church of Montevergine. 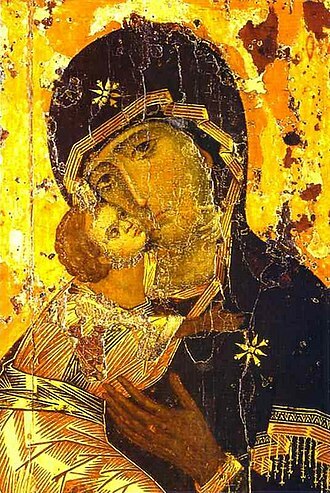 Unfortunately, over the centuries this icon has been subjected to repeated repainting, so that it is difficult to determine what the original image of Mary’s face would have looked like. However, Guarducci also claims that in 1950 an ancient image of Mary at the Church of Santa Francesca Romana was determined to be a very exact, but reverse mirror image of the original circular icon that was made in the 5th century and brought to Rome, where it has remained until the present. 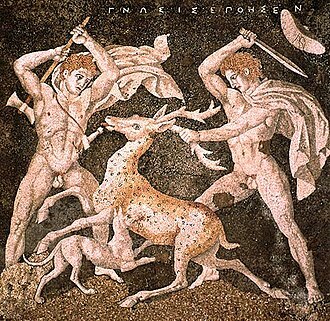 An Italian "original" icon of the Hodegetria in Rome features in the crime novel Death and Restoration (1996) by Iain Pears, in the Jonathan Argyll series of art history mysteries. 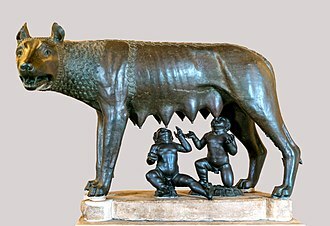 Wikimedia Commons has media related to Hodegetria. 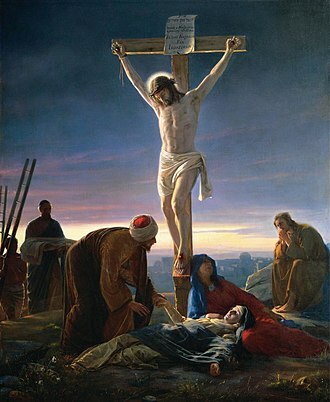 ^ "Image: madonna.jpg, (300 × 556 px)". avellinomagazine.it. Retrieved 2015-09-05. 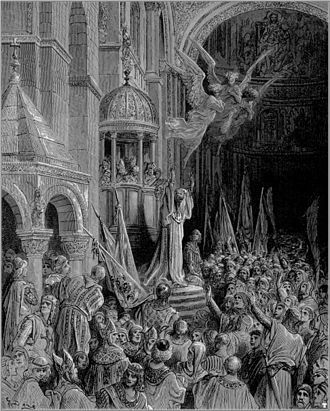 ^ "Image: Montevergine4.jpg, (238 × 340 px)". mariadinazareth.it. Retrieved 2015-09-05. 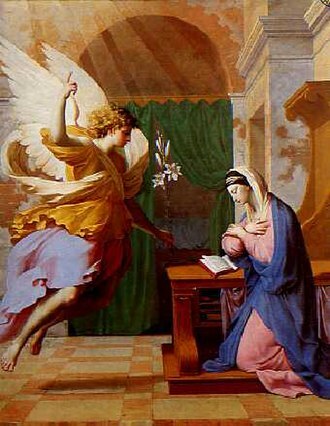 ^ "Image: icona sta maria nuova.jpg, (350 × 502 px)". 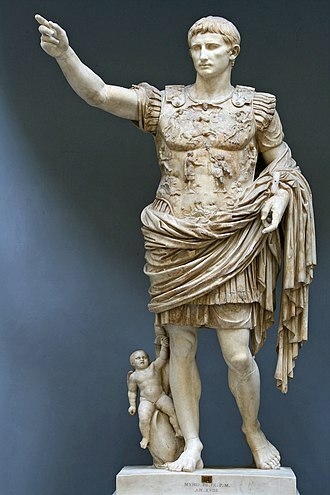 vultus.stblogs.org. Retrieved 2015-09-05. ^ Margherita Guarducci, The Primacy of the Church of Rome. San Francisco: Ignatius Press, 1991, 93-101. Cormack, Robin (1997). 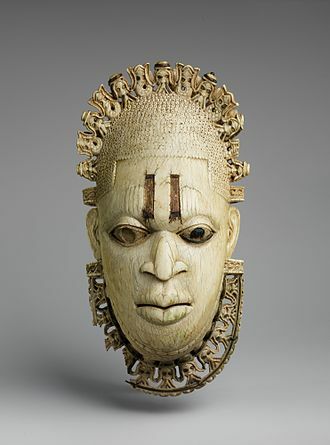 Painting the Soul; Icons, Death Masks and Shrouds. Reaktion Books, London. Kurpik, Wojciech (2008). 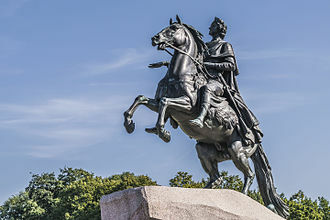 "Częstochowska Hodegetria" (in Polish, English, and Hungarian). Łódź-Pelplin: Wydawnictwo Konserwatorów Dzieł Sztuki, Wydawnictwo Bernardinum. 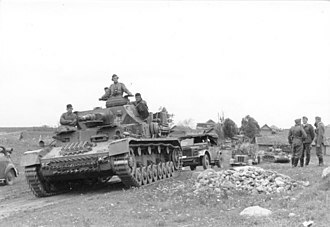 p. 302. Santa Francesca Romana, previously known as Santa Maria Nova, is a church in Rome, situated next to the Roman Forum in the rione Campitelli. The interior has been altered since, since 1352 the church has been in the care of the Olivetans. In the 16th century, the church was rededicated to Frances of Rome and its travertine porch and façade is by Carlo Lambardi, and was completed in 1615. The inscriptions found in Santa Francesca Romana, a valuable source illustrating the history of the church, have collected and published by Vincenzo Forcella. The interior, a nave with side chapels, was rebuilt by Lombardi in the years preceding Francesca Buzzis canonization. In the middle of the nave is the rectangular schola cantorum of the old church, another prominent feature is the confessional designed by Gian Lorenzo Bernini, in polychrome marbles with four columns veneered in jasper. The church houses the precious Madonna Glycophilousa, an early 5th-century Hodegetria icon brought from Santa Maria Antiqua, the twelfth-century Madonna and Child that had been painted over it was meticulously detached from the panel in 1950, and is now kept in the sacristy. 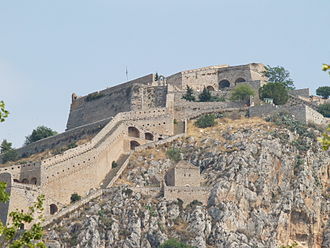 The ancient oratory on which the current church was built was located by Pope Paul I on the place in which Simon Magus died. According to this legend, Simon Magus wanted to prove his powers as stronger than those of the apostles, the two apostles fell on their knees preaching, and Simon fell, dying. The basalt stones where the apostles were imprinted by the knees of the two apostles and are embedded in the wall of the south transept. The tomb of Pope Gregory XI, who returned the papacy to Rome from Avignon, the Deaconry was suppressed on 8 August 1661. S. Maria Nova was reestablished, as the Titulus of a Cardinal Priest, the titulus of the church remains Sancta Mariae Novae, the current Cardinal Priest of the Titulus S. Mariae Novae is Angelo Sodano. A Cardinal Priest no longer has any jurisdiction over his church or its clergy. He is only the Cardinal Protector, saint Francesca Romana has been named the patron of car drivers, because of a legend that an angel used to light her way with a lamp when she travelled at night. Torcello is a sparsely populated island at the northern end of the Venetian Lagoon, in north-eastern Italy. 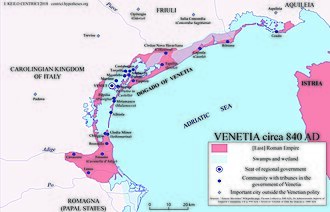 It is the oldest continuously populated region of Venice, and once held the largest population of the Republic of Venice. 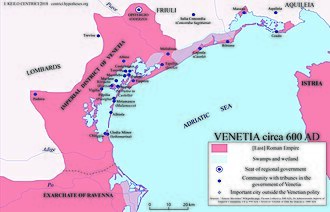 In 638, Torcello became the bishop’s official see for more than a thousand years, in pre-Medieval times, Torcello was much a more powerful trading center than Venice. It now has a population of 10 people, including the parish priest. Torcello is the background for Daphne du Mauriers short story, Dont Look Now, torcellos numerous palazzi, its twelve parishes and its sixteen cloisters have almost disappeared since the Venetians recycled the useful building material. The only remaining medieval buildings form an ensemble of four edifices, todays main attraction is the Cathedral of Santa Maria Assunta, founded in 639. It is of basilica-form with side aisles but no crossing, and has much 11th and 12th century Byzantine work, another noteworthy sight for tourists is an ancient stone chair, known as Attila’s Throne. The Cathedral of Santa Maria Assunta is a basilica church on the island of Torcello, northern Italy. It is an example of Venetian-Byzantine architecture, one of the most ancient religious edifices in the Veneto. 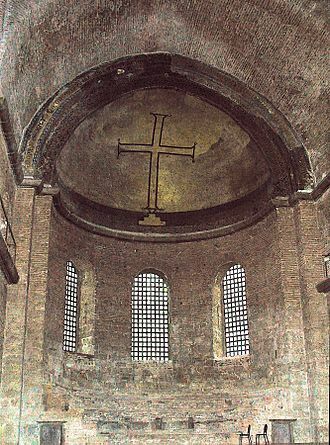 According to an ancient inscription, it was founded by the exarch Isaac of Ravenna in 639, the original church is believed to have had a nave with one aisle on each side and a single apse on the eastern wall of the cathedral. Its difficult to tell what the church was like because very little of it survived the subsequent renovations. The first of two major renovations occurred in 864 under the direction of Bishop Adeodatus II, in this renovation, the two aisle apses that appear today were built. Also, the synthronon that fills the apse was created. The final renovation was consecrated under Bishop Orso Orseolo, whose father Pietro Orseolo II was the Doge of Venice at the time, the façade is preceded by a narthex to which was once annexed the 7th century baptistry, only traces of which remain. On its side is the martyrion, dedicated to Santa Fosca, the bell tower dates from the 11th century. Also annexed was in origin the Bishops Palace, the façade has 12 semi-columns connected by arches at the tops. The narthex was enlarged in the 13th century, in the middle is the marble portal. The most striking features are the decoration of the façade. The interior, with a nave and two aisles, has a pavement, the throne of the bishops of Altino and the sepulchre of St. Heliodorus. The counter-façade has a mosaic of the Universal Judgement, noteworthy is a mosaic depicting a Madonna with Child in the middle apse. The most important artistic element of the cathedral is the mosaics, the main apse has an 11th-century mosaic of famous beauty of the standing Virgin Hodegetria, isolated against a huge gold background, above a register of standing saints. The skull of Saint Cecilia is kept as a relic here, Mosaic, in Christopher Kleinhenz, Medieval Italy, an Encyclopedia, Routledge,2004, ISBN 0-415-93931-3, ISBN 978-0-415-93931-7 Google books Demus, Otto. The Eleusa is a type of depiction of the Virgin Mary in icons in which the infant Jesus Christ is nestled against her cheek. 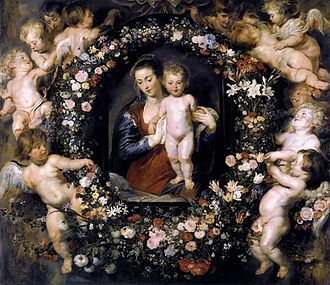 In the Western church the type is known as the Virgin of Tenderness. 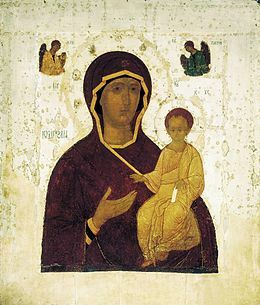 Such icons have been venerated in the Eastern Church for centuries, similar types of depictions are found in Madonna paintings in the Western Church where they are called the Madonna Eleusa, or Virgin of Tenderness. By the 19th century examples such as Lady of refuge were widespread, in Eastern Orthodoxy the term Panagia Eleousa is often used. 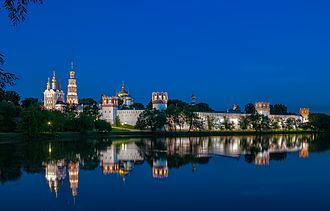 The Theotokos of Vladimir and Theotokos of Pochayiv are well-known examples of type of icon. Eleusa is used as epithet for describing and praising the Theotokos in the Eastern Orthodox tradition, while the Eastern Church does not venerate three-dimensional objects, Eleusa-style reliefs and sculptures, as well as icons, have been used in the Western Church. The Pelagonitissa is a variant in which the infant Jesus makes an abrupt movement, list of Theotokos of St.
To facilitate eye-contact and improve posture when facing an audience, lecterns may have adjustable height and slant. People generally use lecterns while standing, in pre-modern usage, the word lectern was used to refer specifically to the reading desk or stand. One 1905 dictionary states that the term is applied only to the class mentioned as independent of the pulpit. Lecterns used in academia—generally in seminar rooms and lecture theatres—may have certain features that common lecterns lack and these features usually include a microphone stand, audio-visual controls, sometimes even an integrated computer and recording system. Lecterns of this sort are generally attached or integrated into a large desk, in the Christian Church, the lectern is usually the stand on which the Bible rests and from which the lessons are read during the service. The lessons may be read or chanted by a priest, minister, or layperson, the lectern is normally set in front of the pews, so that the reader or speaker faces the congregation. Lecterns are often made of wood and they may be either fixed in place or portable. A lectern differs from a pulpit, the latter being used for sermons, churches that have both a lectern and a pulpit will often place them on opposite sides. The lectern will generally be smaller than the pulpit, and both may be adorned with antipendia in the color of the liturgical season, in monastic churches and cathedrals, a separate lectern is commonly set in the centre of the choir. Originally this would have carried the book, for use by the cantor or precentor leading the singing of the divine office. Lecterns are often eagle-shaped to symbolise John the Apostle, especially in North America and Great Britain lecterns are sometimes made as angel lecterns. Because the Torah scrolls are generally large, the feature of the bimah in a synagogue is a table large enough to hold an open Torah along with a tikkun or Chumash. In some synagogues, this table may resemble a large lectern, in traditional yeshivas and some synagogues and members of the congregation may use small desks called shtenders. The mosque viewed from north east. From left to right, one can see the apses of the Church of Christ Pantocrator, the Imperial Chapel and the Church of the Theotokos Eleousa. The interior of the Mosque, formerly the church of Christ Pantokrator. The byzantine floor in opus sectile lies under the carpet. Roger II of Sicily depicted on the muqarnas ceiling in an Arabic style. Rear area of the church, showing the ruins of the Temple of Venus and Rome.